The area immediately surrounding the Castle is where the story of Newcastle began. A Roman fort – Pons Aelius – stood on the site, followed by an Anglo-Saxon graveyard and, in 1080, the wooden ‘New Castle’, established by William the Conqueror’s son. Join Alex Iles for this talk about the archaeology and social history of the area now referred to as ‘Old Newcastle’. 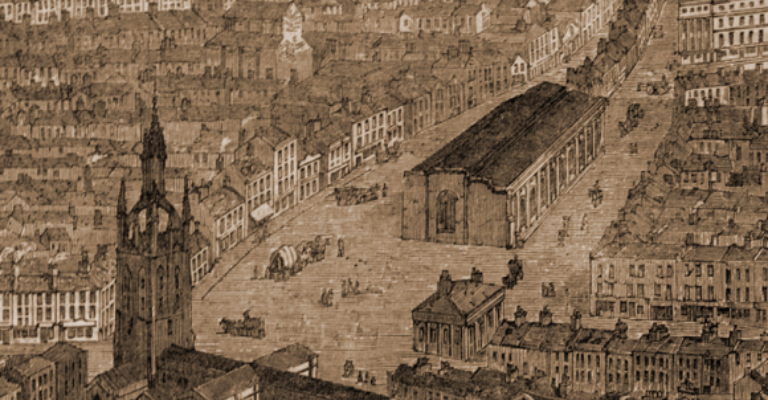 You will be shown a series of archive photographs from Newcastle Libraries’ collection, and hear about the founding of St Nicholas’ Cathedral, Bigg Market and the Literary and Philosophical Society. What was an Iron Age canoe doing buried beneath the old Post Office building? And was Queen Victoria really less than amused by the welcome given to her in Newcastle? This event takes place in the Black Gate, which is fully accessible to wheelchair users. It is an adapted version of 2016’s Old Newcastle guided tour, albeit one which can be enjoyed from the comfort of your seat!